Does your business really need to be on the first page of Google? The short answer is ‘Yes’. This is definitely the case if you operate an exclusively online business. Many of you will know the reason…. how many of you look at the search results on pages 3,4,5 or further back? Most of us don’t. Sure some us will go to the second page but only if the first page yields poor results. It’s critical for websites to appear on Page 1 of Google, especially in one of the top three organic positions, as these spots receive 58.4 percent of all clicks from users, according to a new study from Optify. 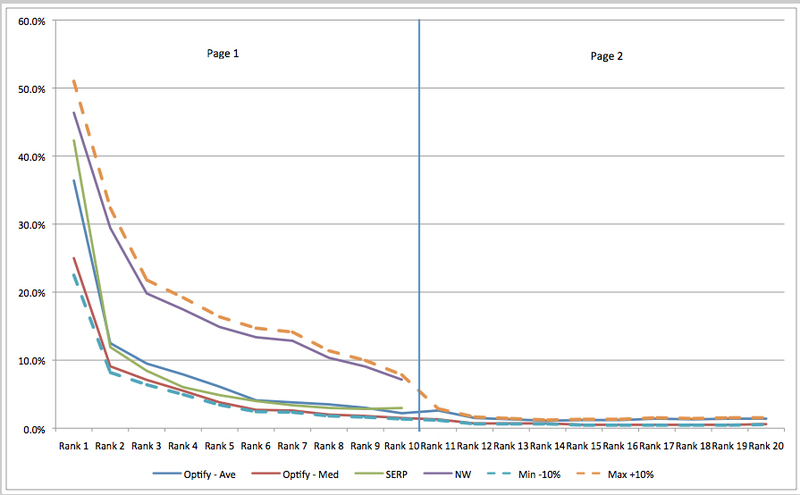 Let’s take a look at the percentage of clicks for each of the 10 first page positions based on a study by Optify. Now lets look at the 2nd page results. 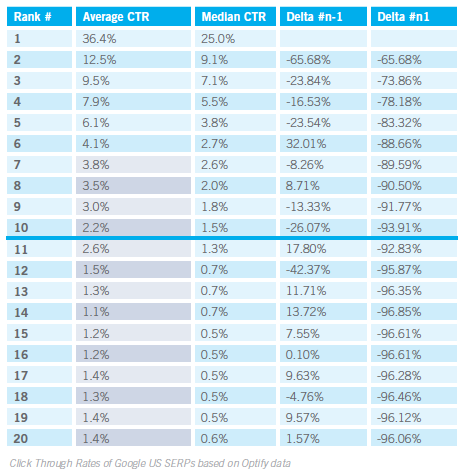 As you can see from the chart below the average percentage of clicks on the second page are between 1-2%. The following chart shows the relationship between position and clicks visually. This chart highlights the dramatic difference between the 1st and 2nd pages of Google. Source: We have collated the data from all known studies on the number of clicks per page position to display in this graph. Note results will vary by industry. As you can see from these average results most businesses need to be getting more than 1.2% of the clicks to successful. What do I mean by this? For example if your most important keyword has a monthly search result of 100,000 searches per month – and you are getting 1.2% of the clicks then you are getting 1,2000 visit to your website each month. If your average conversion rate is 5% then you are getting 60 orders per month. If you average conversion rate is 1.5% (like most websites) then you are getting 18 orders a month. Is this enough given your average order size? If not then you need to considering some Search Engine Optimisation (SEO) to get you onto the first page or at least higher up the rankings. From our experience running our own online store – cornflowerblue – we found that moving to the first page meant our sales tripled in the space of a few short months. Boutique Business Consulting has a great tool – Online Viability Analysis that looks at the online profitability of your business given its Google ratings, average conversion rate and average order size. Our tool shows the impact of improving your Google rating and shows how the investment in SEO can improve your business. Contact us now for more information. If you are considering launching an online business then this tool can help show you your earning potential. This tool will estimate how your sales volume will grow over time as your rankings improve, your conversion improves and your average order size improves. It is not a total mystery what revenue you can make online. Chat to us today. SEO - What not to do! Search Engine Optimisation is all about making sure that your website appears on the first page of Google. If you have a website already then make sure you are not using any of these tactics as your site will be penalised. Tricking Google is getting a lot harder. With an algorithm update coming nearly every day, it’s simply not as easy to trick the search giant into boosting your website to the top of the page. Search engine optimisation experts have told SmartCompany something unexpected: Google and other search engines are cracking down so much on blackhat SEO, there aren’t too many tactics left that make sense to use anymore. “As long as something works, people are going to do it,” says Switched On Media head of SEO Daniel Bailey. But that doesn’t mean you should be using them, even if they provide a benefit. Google is getter better, and better and finding dodgy SEO techniques and cracking down. Here are 10 SEO methods you need to be aware of – and why shouldn’t be using them anymore. Read the rest here…..